Will trees suffer from water stress? Climate change expected to occur in the coming decades may cause forests in northern stretches of the U.S. Rockies to stop absorbing carbon dioxide and even to release some to the atmosphere, exacerbating the planet’s warming. Trees pull carbon dioxide from the air as they grow. Much of the carbon from that gas is stored in wood and foliage, but some ends up in material littering the forest floor and in the underlying soil. From there, it can make its way back into general circulation, says Céline Boisvenue, an ecologist at the University of Montana in Missoula. She and her colleague Steven W. Running used computer models to estimate how three climate-change scenarios might affect carbon storage at forest sites in Idaho, western Montana, and northwestern Wyoming. The good news: By 2089, the growing season in the forests will be at least 3 weeks longer than it was in 1950. The bad news: Over that same period, higher temperatures will cause the trees to suffer water stress—slowing or stopping their growth—for an additional 8 weeks each year. Even under a climate scenario with higher precipitation than at present, trees will have insufficient water for 54 more days each year in 2089 than they did in 1950. By the year 2020, under a scenario with reduced precipitation, dieback of trees and decomposition of leaf litter at three of the six studied sites will cause the forests to emit more carbon dioxide than they absorb. By the year 2070, the forests at five of those sites will be net producers of carbon, says Boisvenue. reported by Sid Perkins from the American Geophysical Union meeting in Acapulco, Mexico. "It relaxes you," explained Chief Selwyn Garu, enjoying his second cup at dusk. "In fact, I'm struggling to talk right now!" The tiny Pacific nation of Vanuatu is battling to defend the reputation of its national drink, a bitter peppery concoction called kava, which is famous for its medicinal, stress-relieving properties. Since 2000, kava has been banned by many European countries, following claims that the herbal remedy can cause severe liver damage. Now Australia has imposed tight new import restrictions because of concerns that it is being abused in some Aboriginal communities. But in Vanuatu, kava drinking remains an essential evening ritual, as the roots of the Piper methysticum plant are washed, chopped, mashed (ideally with a stick of dry coral) and strained into coconut cups. 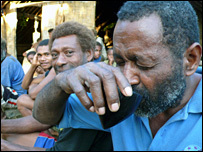 “Everyone knows here that kava is not dangerous,” said Dr Vincent Lebot, a kava expert and enthusiast, based in Vanuatu. Many people on these remote islands believe that kava has been unjustly demonised. They claim that the herb – once widely available globally in pill form as a natural treatment for stress and anxiety, and known as “kava kava” – was encroaching on the turf of international pharmaceutical companies. Now Vanuatu’s case has been strengthened by a new report from the World Health Organisation which appears to rule out a link between kava and liver damage. “Kava cleared!” a recent headline in the local newspaper in Port Vila proclaimed. Instead, local people point to Kava’s stress-relieving properties. Despite the new restrictions imposed by Australia, kava traders in the Pacific are now hoping to revive their export industry, which has been badly damaged by the bans in Europe and elsewhere. Chief Selwyn – one of Vanuatu’s most senior tribal chiefs – is optimistic. But Vincent Lebot is more wary.